More Halloween silliness | Where to next? Poor John and Sophia as wallflowers? When you spend a lot of your time riding around in trucks, events such as birthdays and public holidays are a chance to bring out our creative and rowdy sides. Halloween was a perfect opportunity for us to reel out of control. Our hostel in La Paz, Bolivia, was just around the corner from fancy-dress street and not far from alcohol street, so a Halloween plan was soon in place. Everyone had to draw a ‘victim’s’ name from a hat, and then buy a costume for that person to wear on Halloween. Our spend limit was 50 Bolivianos, or about $7. You don’t need to know details of the draw, except that I got Colin’s name. He’s our driver and he’s ginormous. I might be exaggerating, but I reckon he’s 6 foot 12—and fancy-dress street caters for the kiddies. 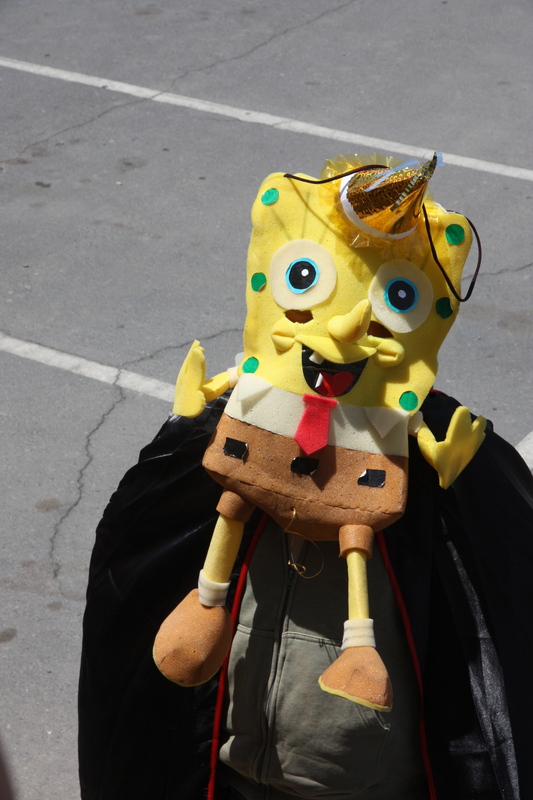 In the end, I found the right mish-mash of ingredients— a generously-sized black cape, a golden party hat and a foam Sponge Bob. Now you might wonder why this was the perfect combo, until you remember that our truck is nicknamed Sponge Bob. My challenge was to turn foamy Bob into wearable art. Luckily, I hoodwinked Colin into loaning me a shoelace, so I could turn Bob into ‘fashionable’ neckwear. 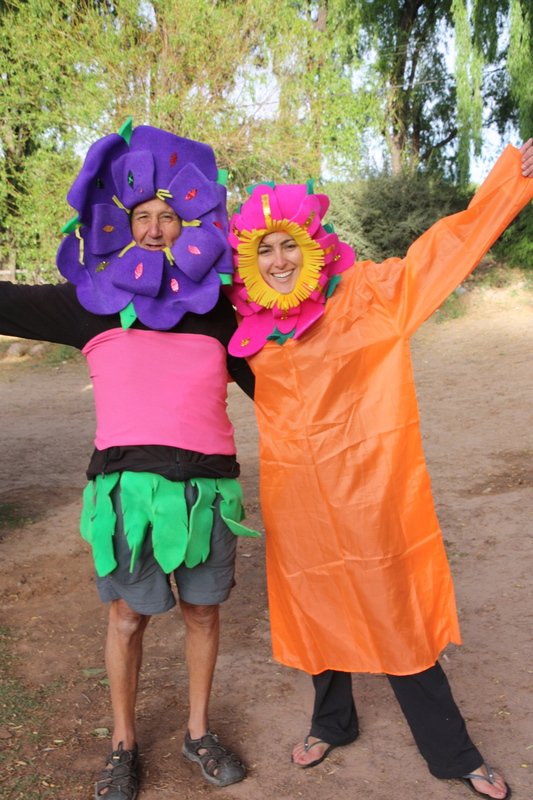 We resisted wearing our costumes as we crossed the border from Peru to Argentina, but we decked out for a trip through the shopping mall to buy groceries. We donned them again when we went to town for a Halloween dinner at an Argentinian steak restaurant. We drew lots of stares, smiles, wolf whistles and laughs from all ages. The next day we went back to behaving like grown-ups—sort of. Besides, our next party date was less than a week away—Guy Fawkes Day on 5 November. P.S. Here are some pictures from the day. The four chickens are here. I came as the Giant Pumpkin. Looks like you have a great bunch of people who know how to enjoy life too! A GREAT reminder to all to always view the world through the eyes of a child and one who still loves splashing in puddles like me too! WHOO HOO! Thanks for sharing all your WONDERFUL adventures and the best to you and Poor John too! You know us too well Joanne. We act like a bunch of big kids. Makes the trip a lot of fun. You do all look very fetching Peggy. But what sort of Australian are you? Where’s the reference to the Melbourne Cup? You might remember that it’s a horse race in Melbourne where people dress up in all sorts of costumes and participate in a ritual called betting where they try to guess which horse will win. There will be questions at Customs when you return! 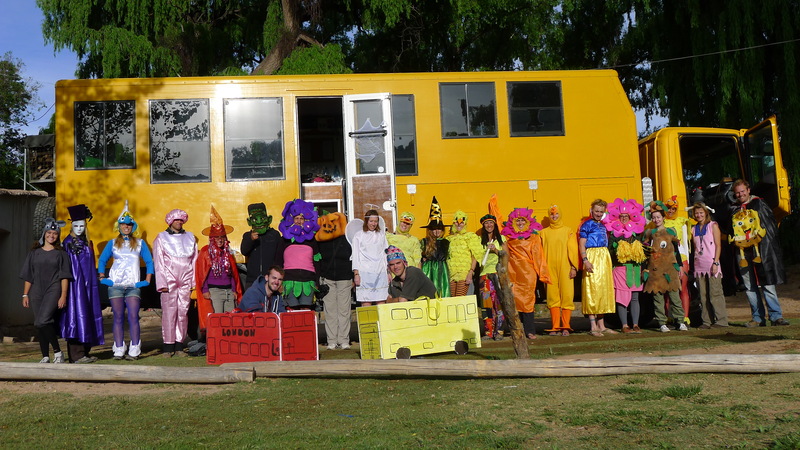 We did do Melbourne Cup—any excuse for a party! And I won the sweep. Poor John had a great time on the volcano. Stay tuned! When boredom sets in | Where to next?